Imagine your home video enhanced with stunning effects. Filmed a wedding? Try to morph the bride into a little girl and vice versa, or morph the groom and the bride together to see how their kids will look. Amuse your friends morphing them into political celebrities, movie superstars or popular musicians. 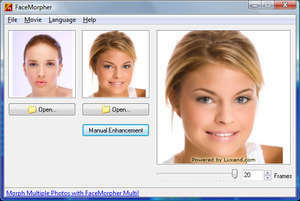 For security reasons, you should also check out the FaceMorpher Lite download at LO4D.com which includes virus and malware tests. Additional screenshots of this application download may be available, too.